Young Tiger NTR and MegapowerStar Ram Charan starrer upcoming multi-starrer film RRR has rolled out its first schedule of shoot today where action scenes are being canned. DVV Danayya is producing the movie. 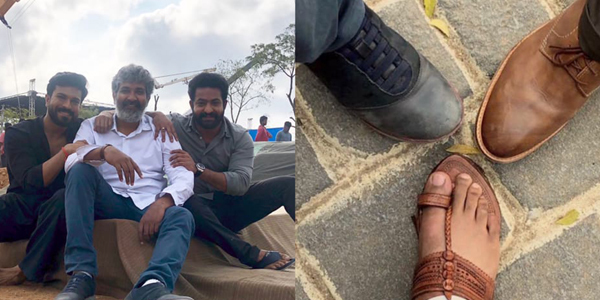 Meanwhile makers had released a video in which Director SS Rajamouli is seen directing the first shot of the film which has turned out to be viral in social media. RRR movie is touted to be an high octane action entertainer which is being made with huge budget. Makers are yet to finalize female leads in this commercial flick. Makers tweeted "The first shot of the MASSIVE MULTISTARRER has been DONE. #RRRShootBegins @tarak9999 #RamCharan @ssrajamouli @srinivas_mohan @DOPSenthilKumar @DVVMovies"
Ram Charan has posted "This time it is going to be even more special!! #RRRShootBegins"